The Emerald engagement ring features the deep green emerald gemstone. They are a distinctive and beautiful engagement ring that many find far more intriguing than diamonds. The emerald is often seen as adding a classic antique sense to the ring and it works well with styles of art deco engagement rings. 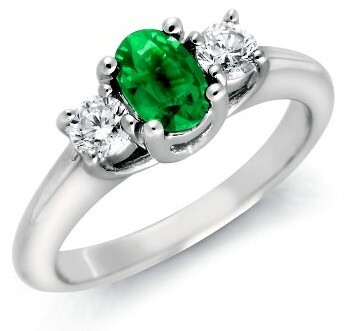 However, emerald engagement ring designs are by no means restricted to classic or antique styles. The gemstone is a perfect choice for anyone who simply loves the deep green brilliance of an emerald. Additionally, emeralds look just as splendid in other jewelry pieces such as an emerald pendant or emerald earrings. Then Design your own Engagement ring! There are more than three possible settings for an emerald engagement ring but the following three work particularly well with an emerald-cut emerald. 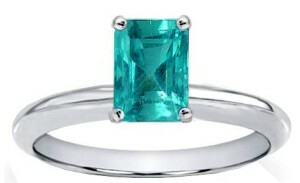 The first is the solitaire emerald engagement ring. The emerald cut itself creates a beautiful and unique optical appearance that stands out prominently in a solitaire setting. The standard solitaire setting for emerald engagement rings feature four prongs holding each of the four corners of the stone. A close cousin to the solitaire ring is a 3-stone emerald engagement ring with the emerald as the center stone and a smaller gem or diamond on each side. Three-stone rings often use the same 4-prong solitaire setting for each stone but this can vary based on the ring's design. 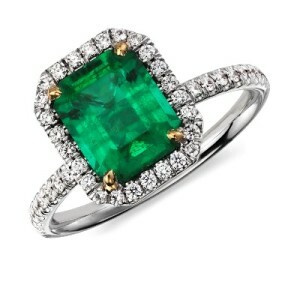 The third setting is an emerald engagement ring with the main emerald gemstone surrounded by pave diamonds. The clear white brilliance of the diamonds in this setting perfectly emphasize the deep green of the emerald, making this one of the most popular choices for emerald engagement rings. This classic effect is particularly prominent in styles art deco and antique engagement rings. What is the Emerald Cut for Rings? The emerald cut features a wide flat open rectangular table on the top while on the bottom pavilion side, rectangular facets decreasing in size almost like a rectangular pyramid. The standard length to width ratio for this cut ranges between 1.3:1 and 1.4:1. However, this is not a hard restriction and can vary considerably. Just keep in mind that when the emerald cut reaches a length-to-width ratio of 1:1 through 1.05:1 (essentially a square), it is considered an asscher, rather than emerald cut. Anyone seeking emerald engagement rings should be aware of the distinction between the emerald cut and the emerald gemstone itself. The emerald cut was originally designed and used for emerald gemstones exclusively. However, the cut has since become popular with diamonds and other gemstones as well. One should be careful not to confuse emerald engagement rings (featuring the emerald gemstone) with emerald cut engagement rings (which may feature diamonds or other gemstones simply cut with the emerald cut). To be clear, this page is about the former and although emeralds are usually cut with the emerald cut, they may also be found in round brilliant, oval, asscher, and other common gemstone cuts. Keep in mind that, as with diamonds, the round brilliant cut for emeralds is considerably less efficient with the raw stone so the price of this cut will be higher than the other cuts for any given carat weight. Emeralds can be graded by the same four Cs as diamonds: color, clarity, cut, and carat. Color is the most important 'C' of emeralds. The most desirable and valuable color for an emerald is a deep green or even blue-green with no brown or yellow hues in the stone. However, there is a balance for color and clarity because the very deep green emerald stones tend to be more opaque than translucent which means their clarity is lower. On the other hand, a deep blue-green emerald is usually more translucent which makes it one of the most desirable hues for an emerald. There is no standard scale for emerald clarity. There is sometimes an interesting trade-off between color and clarity. On the one hand, emeralds are one of the most heavily included gemstones but on the other, these inclusions can be a cause of the deep green color of the stone which can increase its value. Heavily included emeralds will often have a beautiful deep green hue but due to inclusions, they can be nearly opaque. For color, a deep green emerald is very desirable but for clarity, translucence is highly desirable over opaqueness. Therefore, a substantial portion of rough emerald stones are often discarded due to these heavy inclusions. In the end, the beauty of an emerald is in the eye of the beholder. An ideal emerald will have a beautiful green hue that is also crystal-clear but such a stone will undoubtedly command a high market value as well. Either way, don't expect an emerald to approach anywhere near a 'flawless' diamond's clarity or brilliance. To be sure, emeralds can be quite brilliant gemstones but they are not diamonds. Then again, perhaps it is better stated that diamonds are not emeralds! In any case, clarity can be a big factor for emeralds and is generally considered the second most important grade for an emerald (color is the most important).